If you are planning on getting engaged then your thoughts are probably on what kind of ring to get the woman of your dreams. Instead of going into any jewelry store that you pass on the street you might want to consider an antique diamond engagement ring. Not only will it be unique and have charm, they are less expensive and often have better craftsmanship. They will become an instant heirloom and leave her with a feeling of sophistication and longevity. An antique engagement ring refers to a ring that is over 50 years old. 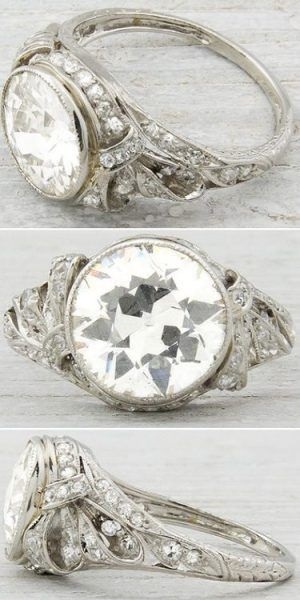 The most charming and unique rings are usually made before 1950 and are sometimes called vintage engagement rings. * Victorian Antique Era (1835-1900) – This ring is often set in yellow or rose gold. They have very simple but elegant designs but can range to very intricate designs. 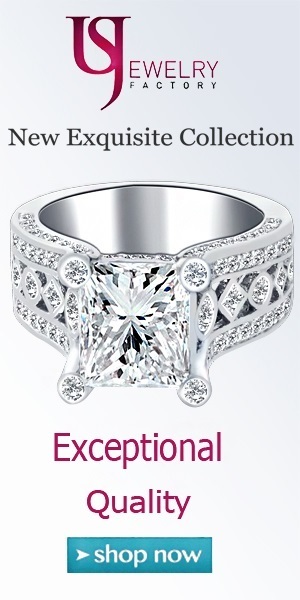 Many Victorian features are the rows of diamonds cut with an extra facet on the bottom. They may include pearls, but are not recommended for the typical engagement ring because they can be harmed with everyday use. * Edwardian Era (1900-1920) – This is when platinum became popular. The rings were lacy with pierced shapes, scrollwork, and filigree detail on the mountings. Brilliant sapphires were often used along with the diamond and are especially popular in this era. * Art Deco Era (1920-1930) – The 20’s were known as an era of machinery, jazz, exoticism, and exploration and the rings definitely encompassed many of these feelings. They have a streamlined geometric look that reflects the fashion trends of the era. They have colorful, contrasting gemstones although they did become more diamond packed for a streamlined, glittery look. This is the most popular of all the eras of antique diamond engagement rings. The difference between the modern engagement rings and the antique engagement rings is that diamonds weren’t always used, or they were used almost as a backdrop to the “real” stone. These stones often have internal cracks and may be easily damaged though, so when looking for an antique engagement ring you really should deal only with diamonds. You need to look carefully at the craftsmanship of the ring because that often makes a huge difference in price and authenticity. 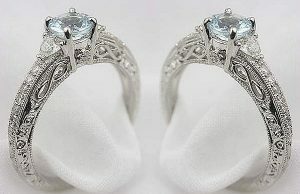 There are many replica rings which mimic the style but can’t come close to the quality and character of an older ring. You need to make sure you get a certified gemologist report stating the complete description of the ring including age, size, clarity, and cut. Otherwise you may end up with a ring that will not stand the test of time. An antique diamond engagement ring is something to treasure. It is a work of art, and speaks volumes about the woman who owns it. It has so much character compared to the plain bands and settings of the modern rings, and is really more of a showpiece then a ring. We hope this article help address some of the most common questions that people have about retro engagement rings. Good luck in your search!